This cake looks really impressive but is so simple to make. Perfect for a birthday or special celebration. You’ll need 20cm/8in cake board for this recipe. Preheat the oven to 180C/350F/Gas 4. Grease and line two 20cm/8in cake tins. Cream the butter and sugar together in a bowl until soft and fluffy. Add the vanilla and a little beaten egg and beat until well combined. Add half the remaining eggs and two tablespoons of flour and mix until well combined. Then add the remaining eggs, another two tablespoons of flour and mix until well combined. Add the rest of the flour and mix until well combined. Divide the mixture between the two tins, smooth the mixture and bake in the oven for 25–30 minutes, or until a skewer inserted into the centre of one of the cakes comes out clean. Meanwhile for the sugar syrup, heat the sugar and water in a small saucepan over a low-medium heat until the sugar dissolves. Increase the heat and let the mixture boil for two minutes. Remove the pan from the heat and set aside. For the buttercream, place the butter and vanilla in a large bowl and beat well with a wooden spoon until light and creamy. Add the icing sugar gradually, and beat until well combined. Spoon some of the buttercream onto the middle of the cake board. Place one of the cakes on top. Spread the cake with buttercream and place the remaining sponge on top. Spread the buttercream on the top and side of the cake. (Spread it quite liberally at first, then smooth around the edges and over the top, removing any excess, to give a neat first layer.) Chill the cake in the fridge for 1-2 hours, or until firm. 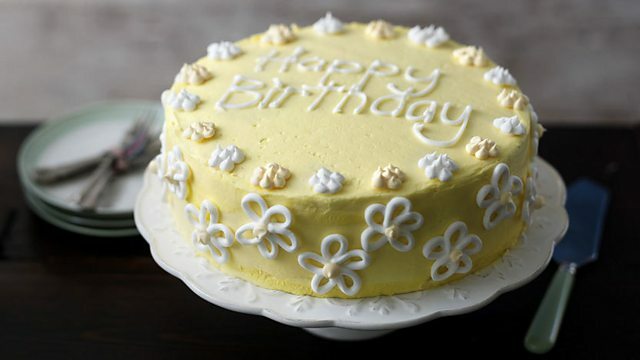 Remove the cake from the fridge and spread over another layer of buttercream. For the graffiti, heat the sugar, golden syrup (or liquid glucose) and water in a heavy-based saucepan over a medium heat. Swirl the pan gently. Once the sugar has dissolved, increase the heat and bring the mixture to the boil. If there is any sugar stuck to the side of the pan, brush it with a wet pastry brush. Cook the caramel for 10–15 minutes or until it reaches 150C/300F (the 'hard-crack' stage). Remove the pan from the heat. To test whether the caramel is ready: remove a small piece of the sugar mixture with a teaspoon and place it into a cup of cold water. Leave it there for a minute or so to cool down. Feel the sugar mixture on the end of the spoon: it should be hard and form hard, brittle threads that break when bent. Add the colouring and flavouring and swirl the pan gently until well combined. Pour the caramel into a heatproof jug. (CAUTION: the caramel will be extremely hot at this point) and set aside to cool slightly for 1-2 minutes. Lay a 65cm/25in wide piece of greaseproof paper out on the work surface widthways. Drizzle overlapping circles of the caramel the whole width of the paper (they should be the same height at the cake). Repeat the process so that you have a thick band of caramel. Remove the cake from the fridge. When the 'graffiti' is firm but still pliable, carefully peel off the back of the greaseproof paper and stick around the cake. Cut off any excess with scissors.